Roter Bolus für Poliment Gold Verarbeitung. Dieser Bolus wird intern von Sinopia hergestellt und ist das Resultat Jahrelanger Forschung und Tests. Le Bolus pour l'usage de l'or Poliment. Ce bolus est produit par Sinopia internement et il est le resultat d'années de recherches et mises á l'essay. O Bolus para a aplicação do ouro Poliment. O Bolus é fabricado por Sinopia internamente e é o resultado de anos de investigação e de postas á prova. Болюс для полимента. Этот болюс производится Синопией и его формулирование -- результат многолетнего исследования и многих испытаний. 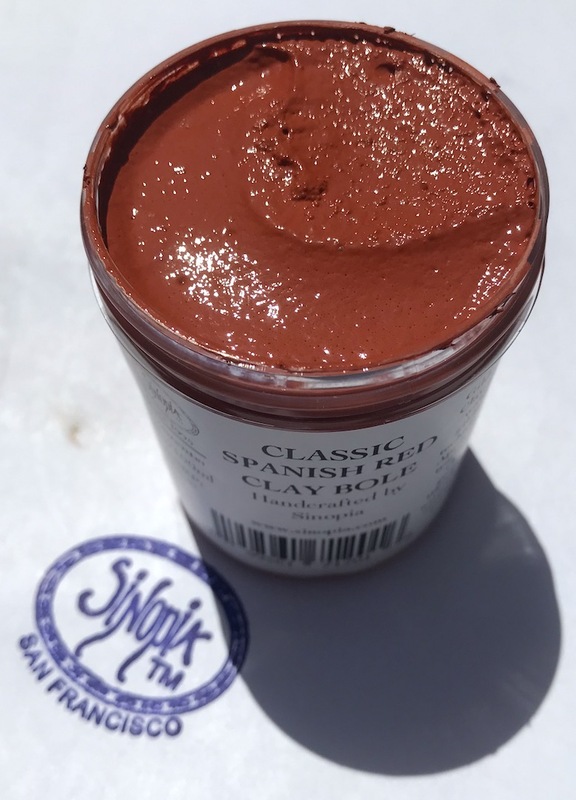 This shade of clay is a recreation of bright reddish orange shade of gilding bole known as Spanish Red. We were able to secure some samples of this historical Clay Bole for testing and color matching. This historical recreation of the Classic Spanish Re possesses the same brilliant orange red shade that made this clay color so emblematic. Bole Clay for use in water gilding techniques. Use over traditional chalk gesso ground. Bole needs to be applied with a solution of rabbit skin glue. This Bole is manufactured by Sinopia. The formula was developed by working with master gilders to craft a rich creamy bole that burnishes to a beautiful highly reflective luster. Q: Is this Bole applied to rabbit skin gesso for best results? A: The Bole must be mixed with rabbit skin glue for an any results. Q: Is bole heated with previously prepared rabbit’s skin glue in a double boiler or just mixed with hot rabbit’s skin glue to get it to desired consistency?